After working for years in the insurance industry, I felt a calling to educate and assist accident victims. Through this book, I offer my guidance and experience to victims of vehicle collisions. While print and digital versions are available through retailers, I decided that the full text should also be available to collision victims who visit my website. Please follow the Table of Contents headings below to find the answers and information you are looking for. If you need more immediate assistance, please call me and we will address all of your legal questions and concerns. In this Chapter, we explore all of the various fund sources and insurance sources that an accident victim can look to for payment of all property damage and injury claims. The discussion includes payments that are made from various sections of an auto insurance policy and other important payment sources such as umbrella insurance, commercial/business insurance policies covering employees who cause accidents, state and federal government sources, short and long term disability insurance, private health insurance and Workers Compensation. This Chapter reviews the types of car insurance that are available in North Carolina including a description of what is covered under collision coverage, liability coverage, medical payments coverage, and uninsured/underinsured motorist coverage. The reader is also provided guidance on how to read and understand the North Carolina auto insurance policy. Mr. Nagle provides a concise but thorough plan of action for all motor vehicle accident victims. This Chapter also includes discussion of North Carolina motor vehicle accident law, common NC traffic laws, and how to determine who owes for victims' damages following an accident. This Chapter includes a thorough review of exactly what insurance carriers and at-fault drivers owe for property damage claims. The discussion covers what is owed for vehicle repairs, how a total loss claim is handled, how to determine whether the damaged car is repairable vs. a total loss, what is owed for a rental car, and specific property damage cases including bicycles, motorcycles and mopeds. In this Chapter, Carl Nagle reveals how insurance companies look at personal injury claims, and how these claims are valued and paid. Accident victims are counseled on how to use their private health insurance coverage to fund medical needs, and how health insurance can be used to increase the victim's net settlement payout. The claims process is covered from beginning to end, and the documents used to consummate a final settlement are described in detail. Mr. Nagle also offers advice on how to effectively present your personal injury claims to all adjusters and insurance carriers. The best personal injury attorneys focus primarily on medical evidence, and work to fully understand how traumatic injuries are diagnosed and treated, and how these injuries typically impact the patient's short-term and long-term health and quality of life. In this Chapter, certain common traumatic injuries are specifically addressed, and guidance is offered on how to properly develop medical evidence to prove the full extent of these injuries. Most personal injury claims settle privately, with no need for court involvement. This remains true even if you hire an attorney to handle your case. However, if the defense fails to offer a fair settlement, a jury trial may be the only option for the accident victim. In this Chapter, Mr. Nagle discusses the process and procedures involved when a lawsuit must be filed and a personal injury claim is brought through a jury trial. 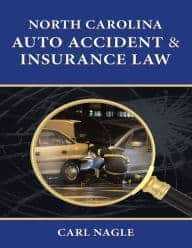 While the entire book is directed toward all motor vehicle accident victims, this Chapter provides specific discussions for the benefit of victims of certain types of accidents including; injury claims of children, hit & run accidents, uninsured driver accidents, under-insured motorist accident claims, motorcycle accidents, moped accidents, bicycle accidents, pedestrian accidents, commercial truck and 18 wheeler accidents, collisions caused by businesses and drivers of commercial/business vehicles, drunk driving accidents, accidents involving animals in the roadway and fatal accidents and wrongful death cases.